“Arizona war worker writes her Navy boyfriend a thank-you note for the Jap skull he sent her.” LIFE magazine’s “Picture of the Week,” May 22, 1944. A rare and disturbing picture, so much about this it’s still a mystery. 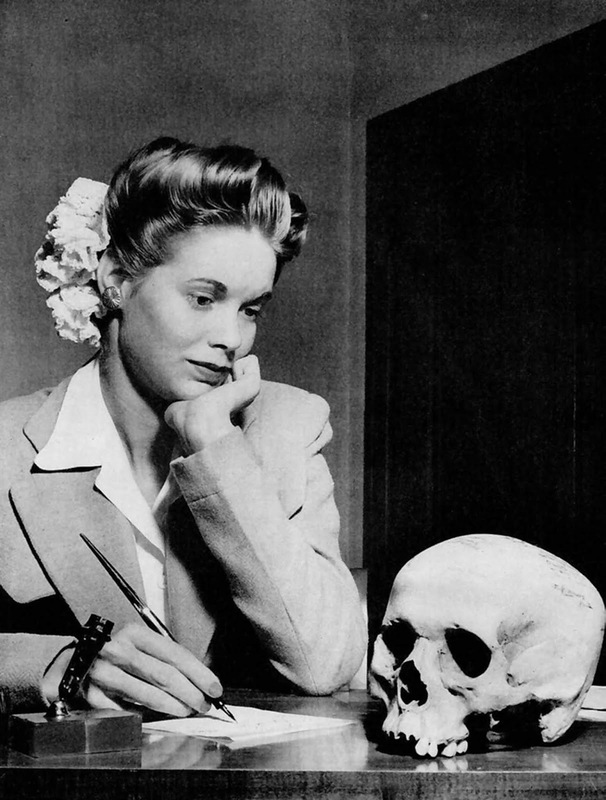 We don’t know what became of the skull—or, indeed, what became of the young woman herself, or the man who sent it to her as a “gift” from the Pacific in the midst of World War II. The image, taken by Ralph Crane, was featured on LIFE magazine as a Picture of the Week in the May 22, 1944, issue. The original caption: “When he said goodbye two years ago to Natalie Nickerson, 20, a war worker of Phoenix, Ariz., a big, handsome Navy lieutenant promised her a Jap. Last week Natalie received a human skull, autographed by her lieutenant and 13 friends, and inscribed: “This is a good Jap—a dead one picked up on the New Guinea beach.” Natalie, surprised at the gift, named it Tojo. The armed forces [LIFE pointedly noted] disapprove strongly of this sort of thing”. At one point President Roosevelt was presented with a letter opener made from a man’s arm. He is said to have received it warmly but to have had the item interred with other remains later. That story and the photo of Natalie and Tojo found their way into the Japanese press. The fact it was so common in the Pacific theater and not European is a testament to the effectiveness of dehumanizing propaganda. Some historians have claimed that stories of US soldiers desecrating remains helped cause the mass suicide of civilians who leaped into the sea at Saipan and Okinawa. After the war, as Japan became a trusted US ally, souvenir body parts ceased to be respectable conversation pieces and were quietly put away. Whatever. As a young medic in the early 1980s assigned to the Air Force Regional Medical Center in the Philippines I took an undergraduate anatomy and physiology class (University of Maryland Asian Division) and the instructor used several Japanese skulls that locals brought him out of some caves in the mountains near the base. We used them in class to study the A&P of skulls, memorize suture lines, and such. It is only offensive by today's polite and effete standards, not the standards at a time when nearly the whole world was at war.